Egypt's ruling generals have approved an amendment to a law that would bar senior officials from the Mubarak era from running for president. 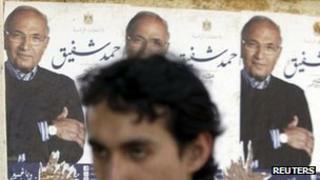 The change could affect Ahmed Shafiq, who served as prime minister last year. Reports say the amended law could be published on Thursday, when the final list of candidates will be announced. Legal experts say that if the amendment is published second, it might have no legal bearing on the candidate list, allowing Mr Shafiq to stand next month. Hosni Mubarak's former vice-president and spy chief, Omar Suleiman, has already been disqualified for different reasons, along with two Islamists. The BBC's Jon Leyne says the amendment to the law governing political rights bars was rushed through the Islamist-dominated parliament after Mr Suleiman announced he was standing for president. It bars from the presidency anyone who served in senior positions in government and the ruling National Democratic Party under President Mubarak in the decade before he was forced to step down by an uprising in February 2011. The list of positions does not include that of minister, so it does not threaten to derail the candidacy of Amr Moussa, who was Mr Mubarak's foreign minister before he became Arab League secretary general. The amendment would disqualify Mr Shafiq, a former air force commander and cabinet minister who was appointed prime minister in the last days of Mr Mubarak's rule and served for a short period under the Supreme Council of the Armed Forces (Scaf), which assumed presidential powers. The military council had been expected to veto the idea. Now the generals have made it clear they have ratified the law, but it is still not clear that it will actually come into force in time for the first round of the election on 23 and 24 May, our correspondent adds. State newspaper al-Ahram noted that if the law was published before the Higher Presidential Election Commission (HPEC) announced the final list of candidates on Thursday, it would lead to Mr Shafiq's disqualification. But it also cited a legal expert who said that according to the constitutional declaration approved in a referendum in March 2011, if the law was issued afterwards, the HPEC's list of candidates could not be challenged, allowing Mr Shafiq to run. Another newspaper, Youm al-Sabaa, said the law would be announced in an official gazette on Thursday and would take effect on Friday. The main candidates still in the race beside Mr Shafiq and Mr Moussa are the independent, moderate Islamist Abdel Moneim Aboul Fotouh and Mohammed Mursi, the chairman of the Muslim Brotherhood's Freedom and Justice Party (FJP).